This is the car I am selling the ’66 Lincoln in favor of. 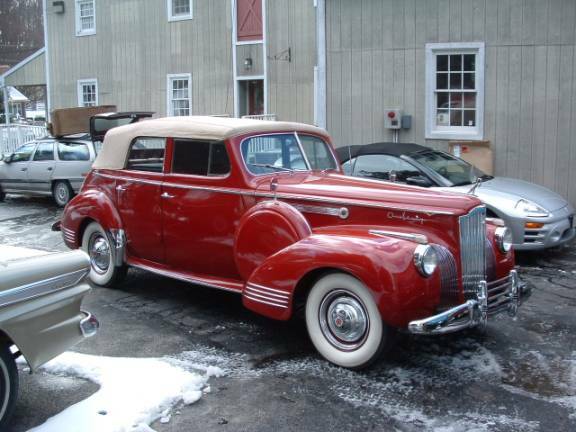 I found it advertised on the Hemmings Motor News website early in November. 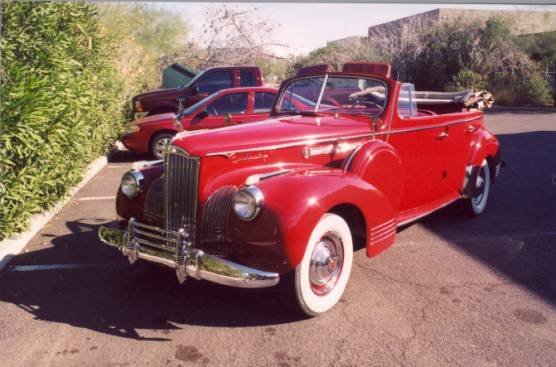 The car is located in Phoenix, Arizona. 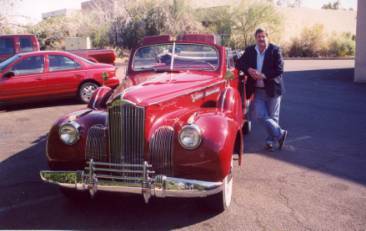 I have since been to Phoenix to inspect the car, and gave the owner a deposit. Now I have to put the necessary pieces together. I hope to have the car here in Maryland by then end of January. Here are a few pictures. Details at Eleven. What I found when I got to Phoenix. Above, after unloading and buttoning up, now to be serviced. Below, ready to roll. (L – R), On the road to Altoona, PA. 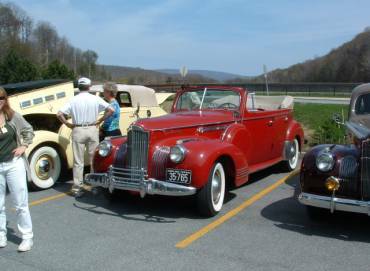 In the parking lot at Horseshoe Curve, Altoona, PA. The ODPC tour was about 800 miles, and a great time. 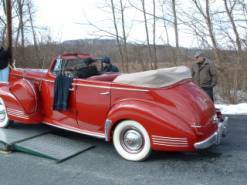 With the exception of what I thought was a worn universal joint, the car ran wonderfully. The above picture was taken parked at Horseshoe Curve, near Altoona. The picture below was taken at the motel just prior to heading home. The weather during the tour could have been nicer. We got more than a bit of rain, and Baby got her baptism of fire (so to speak). Article from The Steering Wheel and Chesapeake Chatter, April – June, 2004 issues. 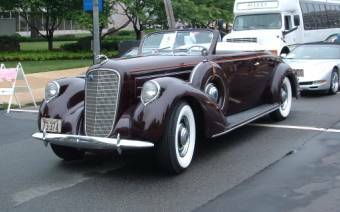 I received a call around the middle of May, inquiring if I would be interested in participating in a Memorial Day Parade in downtown DC. 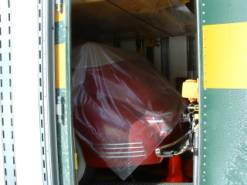 Under normal circumstances, I do not like to put the toys in parades, as they are hard on radiators and clutches. If memory serves, the District of Columbia does not normally stage a parade on Memorial Day, but this year was a bit different. The World War II Memorial was dedicated two days earlier, and this parade was organized to help commemorate that event. 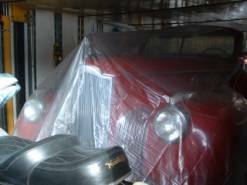 I was asked if I could provide one or more cars. 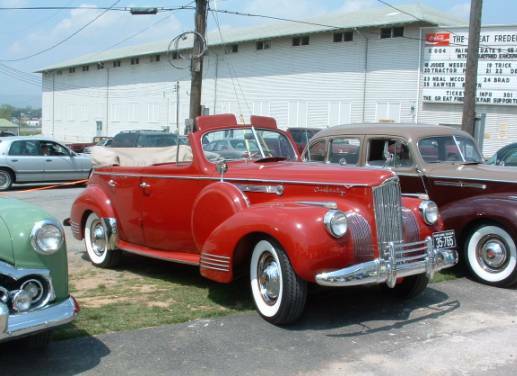 I put the arm on a friend to drive my Packard convertible sedan, and I drove the Lincoln roadster. 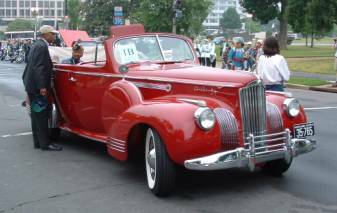 The organizer promised me that the Packard would be driving the Mayor of the District of Columbia, and I would be driving the president of “Rolling Thunder” (a big charity-based motorcycle group). 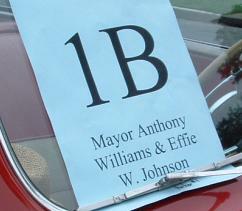 The Mayor brought a passenger with him, a lady named Effie Johnson. Mrs. Johnson’s father served in the military during WW I, she herself served during WW II. Her son served during Vietnam, and her grandson is currently serving in Iraq. As it worked out, the president of Rolling Thunder did not show up, so I was assigned a new passenger: Bill Medley. If the name doesn’t ring familiar, I’ll offer up one clue: The Righteous Brothers. Among the other celebrities present were Nancy Sinatra and Connie Stevens. Memorial Day dawned gray and drizzly, and the forecast was for scattered thundershowers most of the day. We were all up early, as the assembly time was set for 6:30AM. 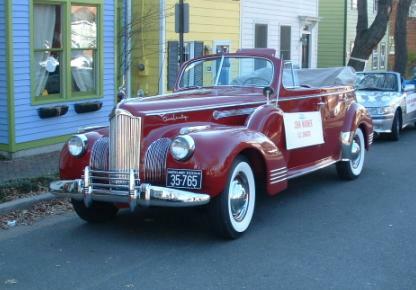 Present and accounted for in the lineup were various members of the local Packard and Lincoln clubs. 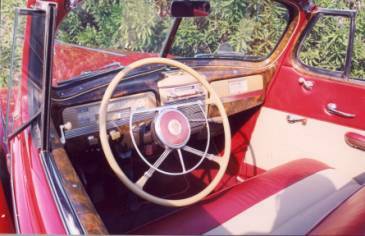 At one point, most of us put our tops down. Then it started to drizzle again and the tops went right back up. 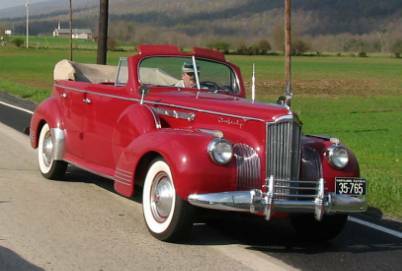 Mrs. Effie Johnson rode in the Editor’s Packard with the Mayor. She is one of four generations of her family to serve in the military. 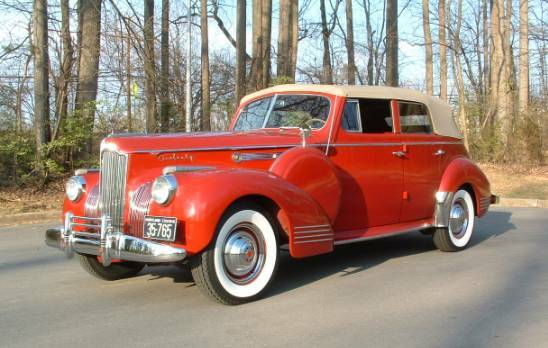 The Editor’s ’41 Packard (L) and ’37 Lincoln (R). At the Memorial Day Parade, District of Columbia Mayor Anthony Williams chats with designated Packard driver Bill Loewy. 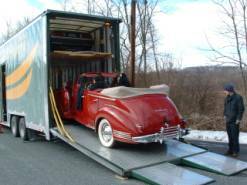 In June, I drove the Packard up to New Jersey for a garage tour with Keystone Packards. 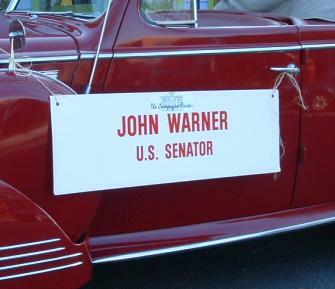 While we were passing through Cherry Hill, the car began to sputter and buck. As we got off of the Interstate, I went to shift the gearbox from third up into second. At that point, I lost a pin in the shift linkage, leaving me with only first and reverse gears. 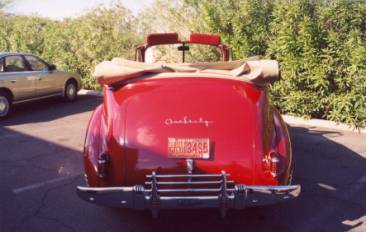 I ended up having the car flat-bedded back down to the Speedwell Garage. We suspect the sputter and buck was either vapor lock, contaminants in the gas, or an incorrectly-plumbed gas line. We don’t know for certain, as she wouldn’t misbehave on command. 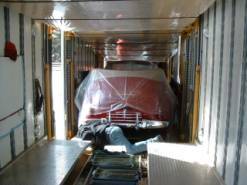 At the same time, the overdrive was finally ready, and the car got her gearbox transplanted. In late July, the RROC was having a weekender down in Charlottesville, Virginia to send the Lewis and Clark tour participants on their way. I decided it was the perfect opportunity to test out the new overdrive. While down there, we toured Montpelier, James Madison’s home, and Thomas Jefferson’s Monticello. The overdrive makes all the difference here. 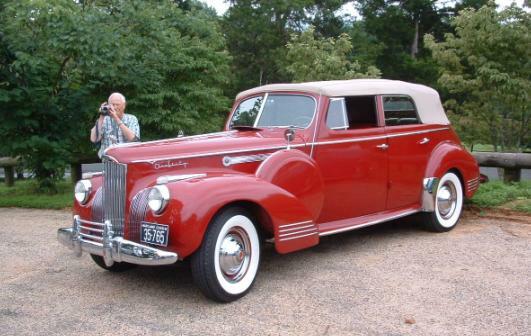 The car loafs down the road at 60mph. In the parking lot at Monticello. 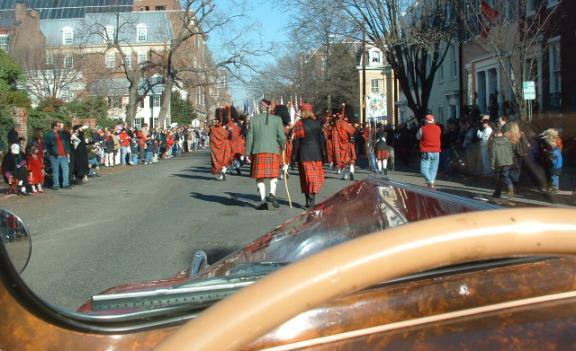 I received a phone call recently asking if I was interested in driving the Packard in the annual Scottish Christmas Walk in Alexandria. My passengers were supposed to be U.S. 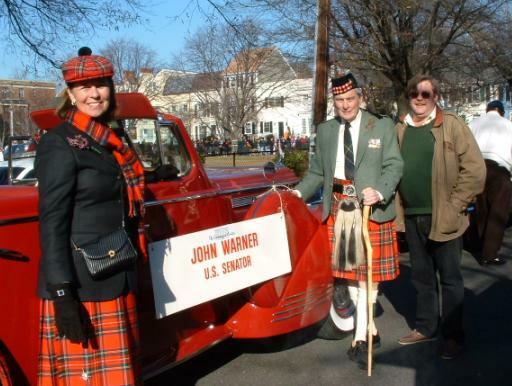 Senator John Warner and his wife. They decided to walk the parade, with me following them. 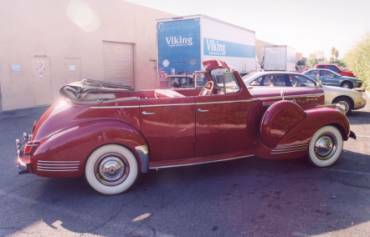 Last year, work was rather consuming, and I only got the Packard out a couple of times. 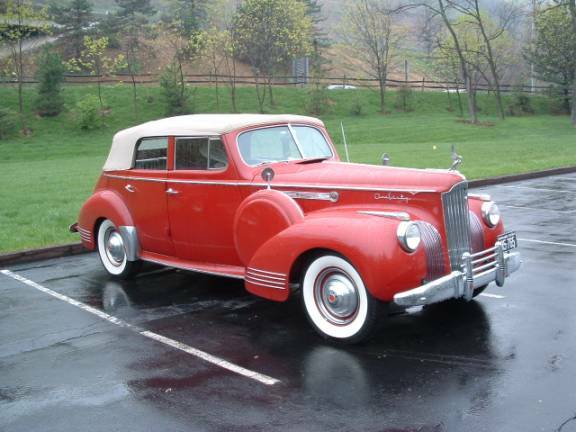 The purchase of the ’36 Lincoln necessitates the sale of one car. 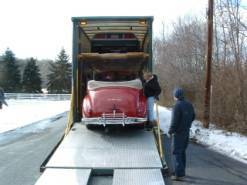 The Packard went to a new home this month. I still have very mixed emotions about this.